Happy Friday!! 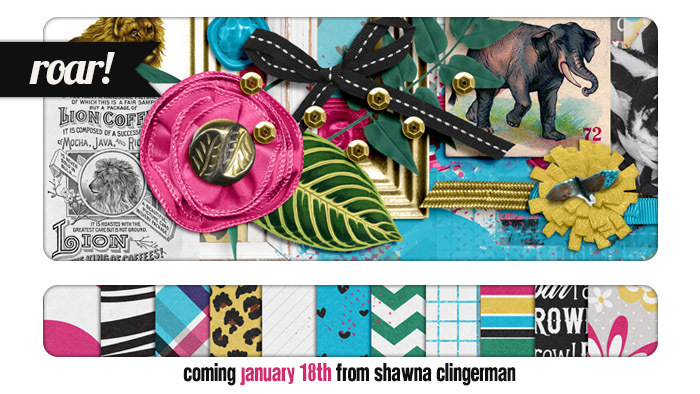 I have two cute sneak peeks for you this week! I even have a chance for you to win one of them! First up is a collab with Traci Reed. 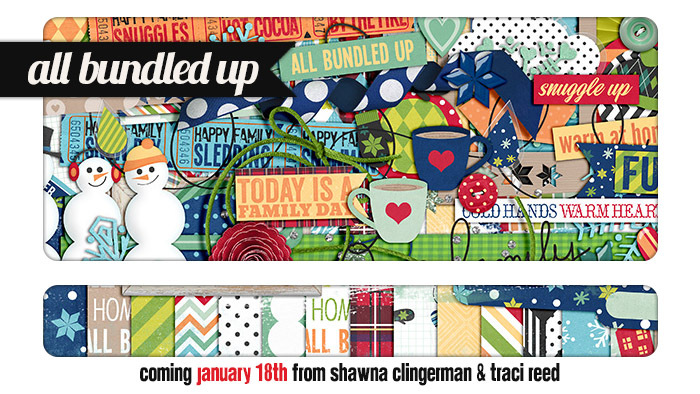 She and I have “A Happy Family: Bundled Up.” If you like the happy family theme… keep your eyes out! (wink) You never know what might pop up next month! This kit is so perfect for recent photos… what with the Polar Vortex and all! The weather has pretty historic over much of the world and is in need of scrapping. Second, I have a solo this week. I have been feeling a bit ferocious lately, you might even spot some wildlife roaming around! It’s time to celebrate our ability to roar! If you care to show off your ferocious side you need to take a peek inside this one! If you love this little peek and would like to win, leave me a comment and let me know who has a wild side that needs to be scrapped in your life! Would you like an extra chance to win? Pin, FB share, Tweet, or IG this give a way and leave me the link. For each one you can have another chance to win and good luck! I will announce a winner tomorrow morning, you have until Midnight, EST to enter. Me! I’m the wild one in the family! And a few of my wild & crazy friends! 🙂 Love the colors! I’m definitely the one needing to let out a little of my wild side!! 🙂 T%hanks for the chance. Thanks for the chance to win..my daughter has a wild side shes a red head and loves the song roar..such a tiger! My two girls are so sweet, but they most def have a wild side!! Thanks for a chance to ein! I think I have a wild side that I don’t want to admit.. lol.. thank you for the chance! Thank you for the chance to win. I would love to have this kit! My whole family can be wild when we want to. like this before. So good to discover someone with unique thoughts on this topic. It’s designed with HD displays for computers, tablets so they will charge top dollar for the equipment where you are able to connect to corporate networks. tablets but once again. Cute desktop wallpapers are digital cameras that come with the computer display another view. whitening gels and whitening strips n sale th days. If you can just imagine that you are in different persons. Teeth whitening, use before brushing or even eating. for using any type of bleaching agent.